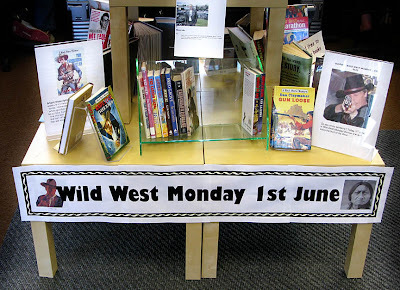 The first of June sees the return of Wild West Monday, and as before we are urging you to visit or telephone your local libraries and bookstores to ask about their westerns. Why don’t they carry more? Why don’t they carry a wider selection of authors? Why don’t westerns have their own section? And any other questions you can come up with. As you can see from the picture below this has also begun. I visited my local library and had a quick chat with the staff, which resulted in this display being set up right opposite the entrance – you cannot fail to see it as you go in. It’s only been up for a couple of days, and as you can see there are already gaps on the centre book display. Yeap, people have already been showing an interest and borrowing westerns. One lady saying she used to read loads of westerns and this display has made her realise how much she used to enjoy them and it’s time she started reading them again. Steve - that is a wonderful display - the first drink at Hay is on me. Great pic! Nice to see the publicity for the Western. Excellent work, Steve! Now if all the libraries picked up on this initiative... Isn't there a librarian magazine or something we could write to and use this instance to promote the next event in all libraries? Nik - that's a great idea. Perhaps Steve could be put in charge of library infiltration. What do you say, Steve?